Ice Climbers is a very difficult character to master. Their metagame revolves entirely around their advanced techniques. They have the best grab games of all, since having two of them means they can throw an opponent to the other climber, which can grab again. The Ice Climbers also has the unique ability to desync, as in controlling two Climbers separately to confuse opponents and to increase ICs options. However, the Ice Climbers have a small grab range, so landing a grab in the first place is hard. Chaingrabbing and desyncing also requires strict timing and lots of practice. A single climber is also very weak, and lacks a horizontal and vertical recovery. Also, they're easily separated and their chaingrabs are useless in anything that's not one-on-ones. 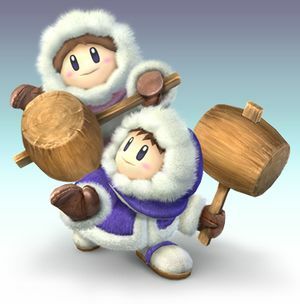 Overall, Ice Climbers are a character who requires dedication and determination. But once mastered, they can become a dangerous character to spar against. Hammer Combo Swings their hammers two times. + + + + Hammer Swing Swings their hammers. + + + + Hammer Spin Spins their hammers above their head. Deals multiple hits. + + + + Hammer Sweep They sweep their hammers lowly. while dashing while dashing while dashing while dashing Lunge The Ice Climbers lunges at the opponent. Smash + + + (Smash + ) or (Smash + ) or Hammer Slam They slam their hammers on to the ground. Smash + + + (Smash + ) or (Smash + ) or Hammer Whack They swing their hammers above them. This move has high knockback and is IC's main KO move. Smash + + + (Smash + ) or (Smash + ) or Hammer Spin They spin around, hitting things with their hammers. after grab after grab after grab after grab Headbutt Headbutts their opponent. after grab after grab after grab after grab Hammer Smash Smashes the opponent forward with their hammers. Try slowly tilting the control stick in front then press grab to perform this kind of chaingrab. You will gradually move forward while doing this though. after grab after grab after grab after grab Hammer Bash Smashes their opponent backwards with their hammers. Try slowly tilting the control stick backwards then press grab to perform this kind of chaingrab. This chaingrab is more effective as you're throwing the opponent back and forth between them. after grab after grab after grab after grab High Bash Throws opponent upwards then samshes with their hammers. This is the only throw that can't chaingrab. after grab after grab after grab after grab Ground Slam Slams them on the ground. Try to grab the opponent as they bounce of the ground to perform the chaingrab. Another chaingrab can be perform by only one climber with this move, although this chaingrab is not infinite. Spinning Hammers The Ice Climbers spin around, hitting with their hammers. + + + + Hammer Thwack Swings their hammers downwards. If the partner's move hits, it meteor smashes. + + + + Back Hammer Swings their hammers behind them. + + + + Hammer Thrust Thrusts their hammer upwards. This move can KO at high percentages. + + + + Hammer Plunge Plunges downwards with their hammers. Ice Shot Shoots two ice blocks at foes. When only one is alive, it shoots out one. + + + + Squall Hammer Attack with spinning hammers. When only one is alive, this attack does less damage. + + + + Belay The Ice Climbers pull each other upwards with a long rope. It only works if they are together. + + + + Blizzard Attacks with a chilling breath that can freeze you. If only one is alive, this attack works on only one side. They put down their hammers and jump around. + ( or )+ or or They hold out their hammers. 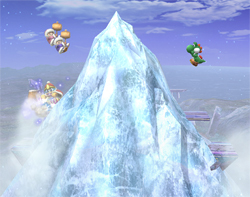 Iceberg: The Ice Climbers send a gigantic iceberg up from the ground that covers almost all of the stage, leaving small platforms to stand on. These platforms will be slippery, and the iceberg can hurt your opponents or even freeze them. This page was last edited on 1 September 2014, at 04:14.